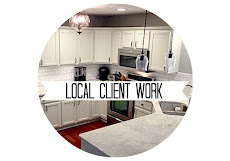 which is part of my "whole house" client job. We are tackling every room, including the entry and stairs. 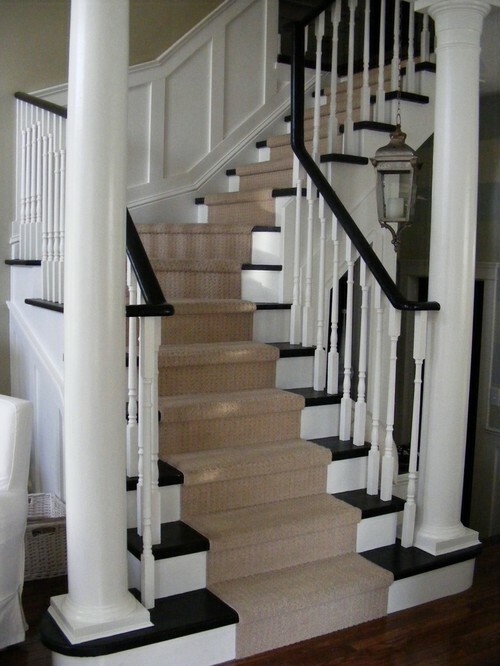 I'd like to paint the moldings and spindles, but stain the treads and railing a darker wood. 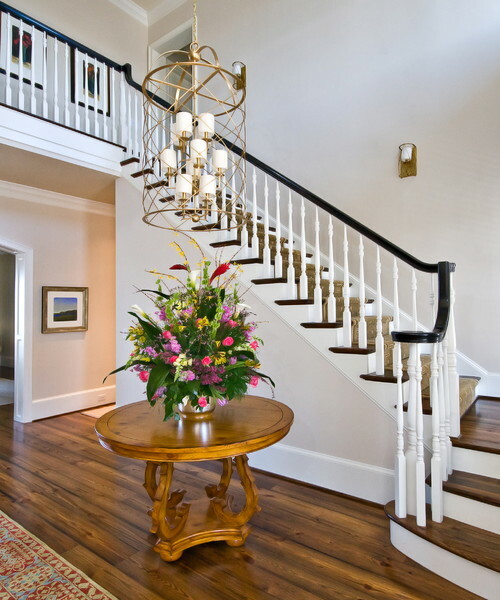 Here are some extra pieces of inspiration from beautiful stairways. Also, take note of the moldings! Some of them are very beautiful. 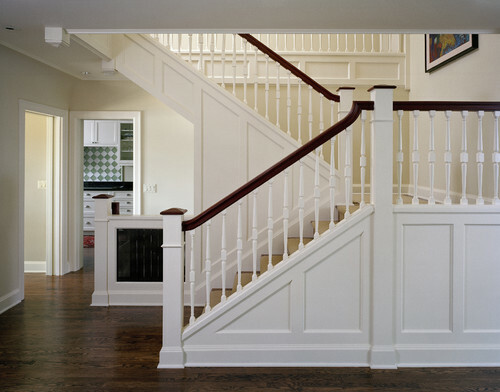 traditional staircase design by grand rapids architect Visbeen Associates, Inc.
Loving the little nooks and spaces under the stairs. I think this special reading/play area would be fabulous for when they finish the basement of the T. house. traditional entry design by dc metro kitchen and bath Case Design/Remodeling, Inc. 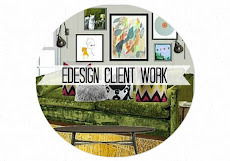 Editors note:Click here to see how the client's stairway looks finished. It's a great transformation! How do you feel about painted stairs? A do or a don't? I love painted stairs, Abby! But oh the nightmare when the love passes and they need to be redone. Painting risers is always changeable, but more than that is risky. I'm talking about risky when it comes to bold colors on railings and such. Gorgeous inspiration! Good luck! 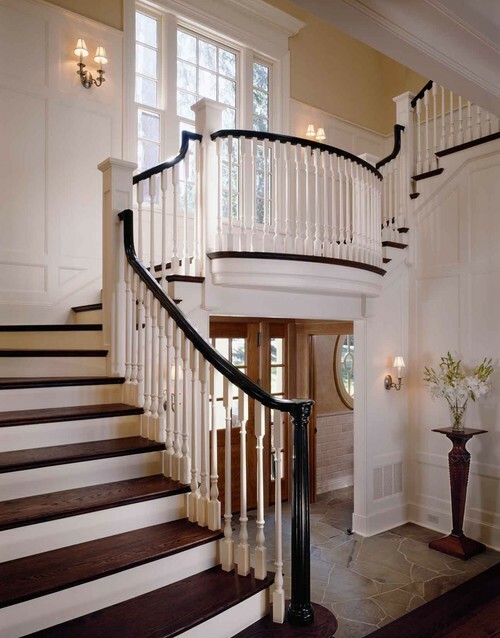 I love dark railings and steps with the white risers it looks instantly more expensive and elegant. I painted my staircase in Sweden all white. I thought it would wear out and get dirty, but surprisingly that doesn't happen. Abby I love your idea stain the treads and railings....it will be gorgeous, a biig job though!! Cant wait to see how it turns out! We ripped carpet off ours and it made a HUGE difference! 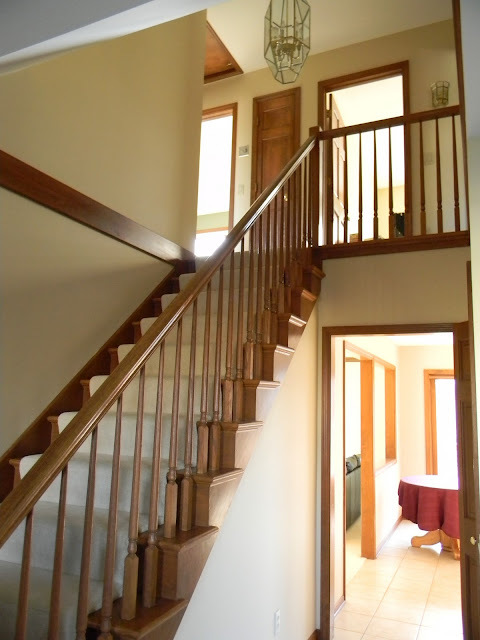 Now i want to paint/stain the banister and paint the spindles white...but it is a scary and time consuming job! Maybe I can get inspired by yours! 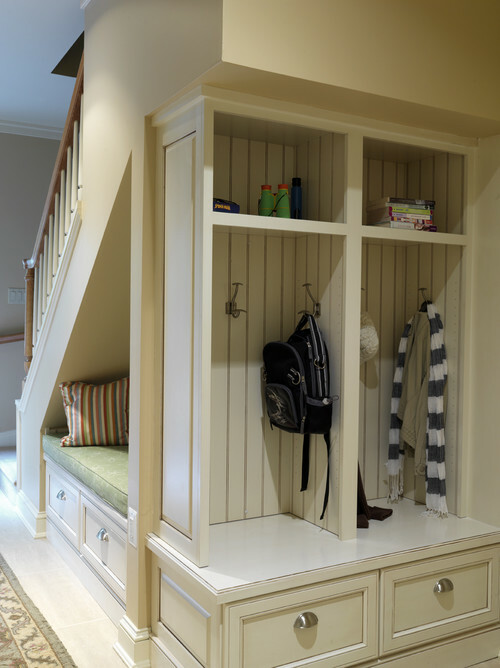 We love painted stairs and go for storage and a bench in play room. I think it's a more classic look, and suits a home with plenty of white trim throughout. People are always hesitant to paint wood, but it's really only the handrail and treads that take the wear and tear. 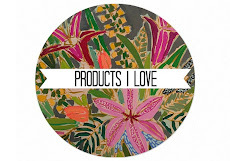 I say if your clients love it then they should go for it! 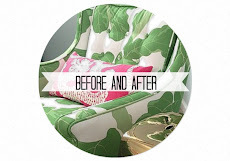 Love your inspiration pic & can't wait for the finished project! Your existing stairs are almost identical to mine! I have been wanting to change mine for awhile and now you have me motivated again! Gorgeous inspiration photos! Oh, and because we have uncarpeted, stained stairs to our basement and I slip on them all the time. I should have added that we are using keeping a runner on the stairs. They have two young children and we don't want any tumbles! Thanks for all your feedback! I love hearing from you! Definitely a do- I have painted white spindles and risers with wood stairs and hand rail- hoping to add the runner as well- I've had one tumble and it wasn't at all fun. Your new staircase will look fabulous once it's done!! 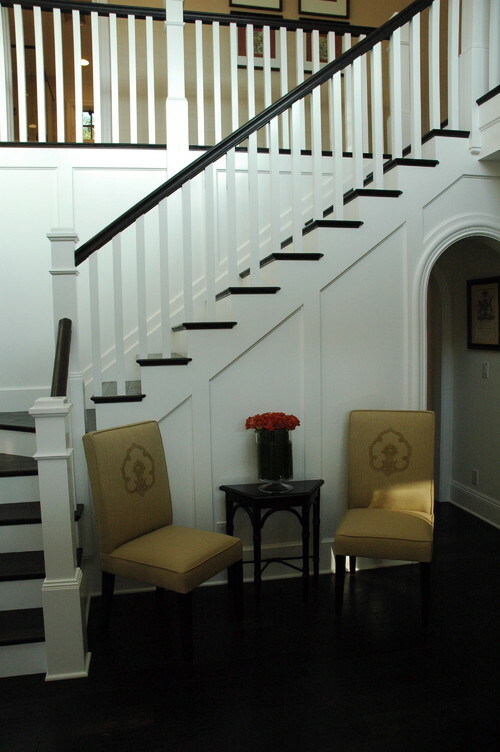 Love the contrast of white and dark staircases - it's so dramatic! The first picture is gorgeous and the last picture with the cubbies is so functional and cute. I love all the staircases, especially the dark ones. Great contrast. I can't wait to see you working on your new house! Beautiful inspirations. I can't wait to see the final product. I say a total DO!! It differentiates your house from others. 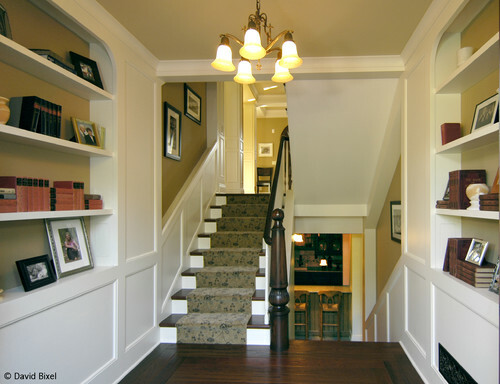 I looove that nook under the stairwell idea! The last picture is so clever! Functional and beautiful all at the same time! Now I don't have any stairs and I am not sure about the painting process, but I have seen it done many times. So I know it will turn out well. Do keep us updated on the progress. Can't wait to see it finished...love the character dark wood and gorgeous moldings add to the house!! Hi! This is Jake from Dusty Gem Decor. I want to let our followers know that in order to make things easier, we brothers have decided to have two seperate websites. Restoration Furniture will be doing summer sales and will try to continue to post items for sale as well as provide custom refinishing for customers. Dusty Gem Decor is based on the same principles as Restoration Furniture. We too will post items for sale and offer refinishing for customers. Become a follower and have a chance to win a prize in our next give away. Tell your friends. Thanks! Definitely a "do" if it ends up looking like those! So gorgeous...there is just something about that dark wood and white contrast that is just amazing! I LOVE the look! Can't wait to start seeing the changes! i can't wait to see your end result. i LOVE painted stairs and depending on the style of the house (obviously more rustic spaces) i think they look amazing if they start to peel a bit too! 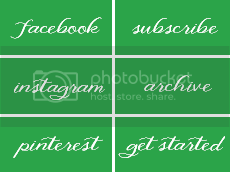 Love your inspiration pictures...sigh! Wish I had a staircase to paint, they are wonderful. I have the EXACT same job going on right now. I am hoping to convince my client to paint and stain darker. They love their oak. (And it is everywhere). I am starting with a white painted mantle in their living room and will hope that once they see how beautiful it is they will be willing to carry the look throughout. Your inspiration photos are great - I will definitely bookmark this to show them when we get to that point! Gosh! 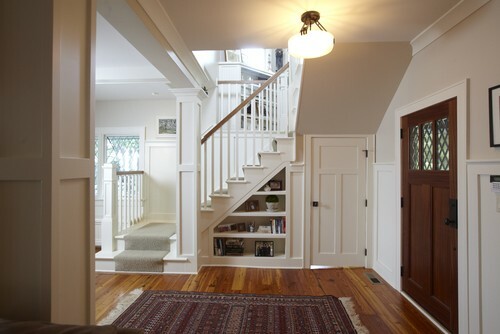 I wish I had a huge entryway staircase to play with! Love all these ideas...just gorgeous! Really crushing on that last one and the first one! you really ARE a girl after my OWN heart!!! love love LOVE the inspiration pic!! I can already picture it! How exciting to get to transform the whole house! She's gonna love it! The stairs look fabulous! I am definitely a fan of carpetless wonder Great job! Definitely an inspiration to me for my own staircase.